Seeds of Africa is a community upliftment intervention, aimed at driving skills, enterprise and supplier development as well as socio-economic development. We support entrepreneurial businesses in previously disadvantaged communities in Johannesburg, South Africa. Working with small businesses in the areas of Muldersdrift/ Lanseria, we offer strategic direction with assistance in writing business plans; operational support and assistance in setting up and maintaining financial business systems; people development, training and mentorship; marketing and distribution and the provision of risk- and interest-free seed capital. Find out more about our enterprise and supplier development work. We also play a major role in uplifting communities by supporting a growing number of early childhood development centres with infrastructure, learning aids and training. Find out more about our socio-economic development work through our Adopt-a-Creche Programme. Seeds of Africa is housed in its own building at the Ngwenya Glass Village, Muldersdrift which serves as a base for both the skills development centre and the various small business start-ups that have benefitted from our initiative. We’re a small team of five staff, several of whom are drawn from the communities we work in, supported and advised by our board of directors. We’re a registered Non-Profit Organisation (NPO) and Public Benefit Organisation (PBO) so any donors are eligible to receive Section 18A Certificates to claim a reduction from corporate taxable income. 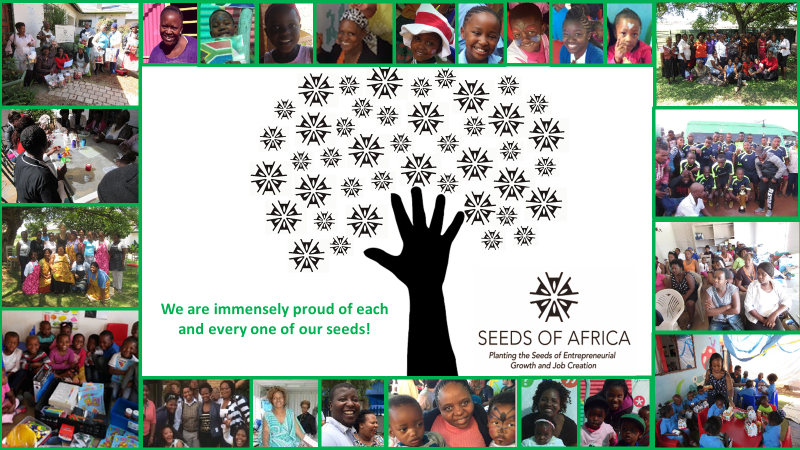 The nature of Seeds of Africa and it’s associated businesses places us in a unique position to support the country’s transformation objectives through being a community upliftment, job creation, full-service incubation facility which supports small, black-owned enterprises. As it is fully verified in its Enterprise; Supplier Development (ESD) and Socio-Economic Development (SED) status, any investment in these entities can be recognised within an investors BEE scorecard. Each of our associated businesses is also BEE verified and fully independent, each functioning as a small business adding value as a supplier by offering products and services.